Plaster pools are the most common type of in ground pools in the USA. There comes a point when the plaster starts to get old and pitted. This is due to age and the years of chemicals eating away the finish. Many times plaster degradation is due to improper water balance. Some problems with a plaster finish can be caused by the mix or the application of the plaster. In any case, plaster is a natural product, and is meant to degrade. Hard enough to be durable, but soft enough to remove a thin top layer by acid washing. Also important whenever draining a pool is opening the hydro static relief valves. 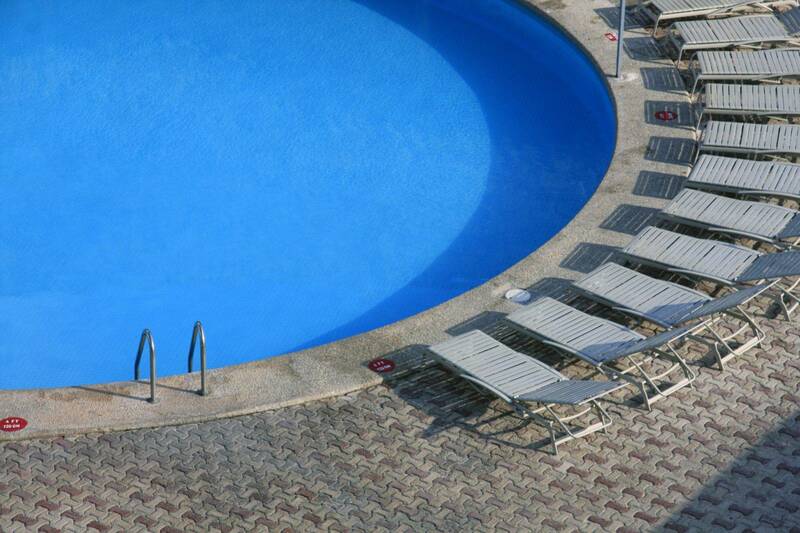 These are commonly spaced throughout the floor of the pool, in both shallow and deep end. These white caps are plastered over and need to be chipped out and exposed, before they can be unscrewed and removed. Excess table water beneath the pool, or water that you are pumping out of the pool, can put so much pressure (hydrostatic pressure), under the pool shell that it can actually lift the pool out of the ground! Pop! As a pool is draining, the hydrostatic plugs are removed - very important - to allow the excess water beneath the pool to flow into the pool. The goal is to remove a chip under the tile, that space where the chip is if how the plaster goes up to the tile without creating a budge. It will leave a nice smooth transition from the plaster to the tile. Next you will want to chip around the return and drain fittings in the pool, and also any underwater light niches. Be sure to follow proper safety measures. Wear gloves and goggles and a face mask. Make sure pool is drained fully in case you drop your tools in the water. This is rather dangerous work, so be sure to hire a qualified contractor.